Economic growth over the long run is determined by the number of workers and how productive they are. 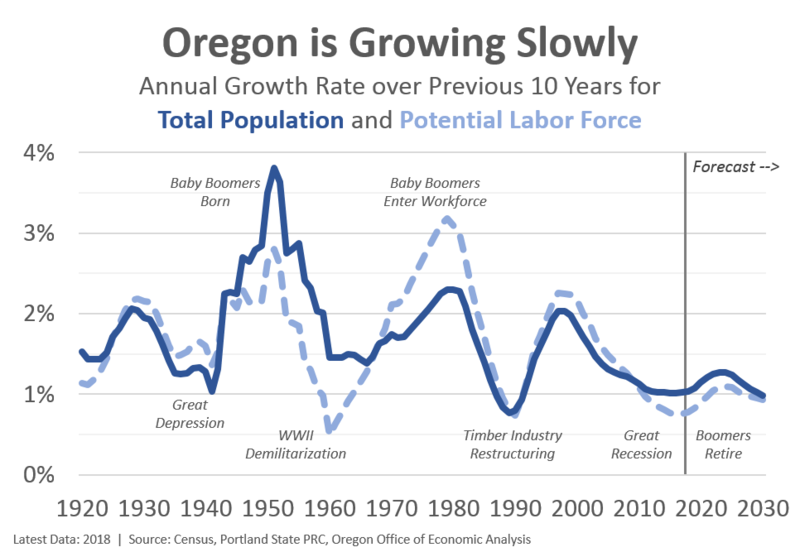 The main reason Oregon outperforms the typical state over the entire business cycle is our stronger population growth. In particular, the influx of young, skilled households boosts our economic potential as our working-age population increases faster than in much of the country. The big economic problem today is that demographics have turned into a major headwind. First, overall population growth is as slow as we have experienced in the past hundred years. It is not expected to pick up significantly either. Second, Baby Boomer retirements mean the working-age population is growing even slower and in many places around the country it is shrinking. 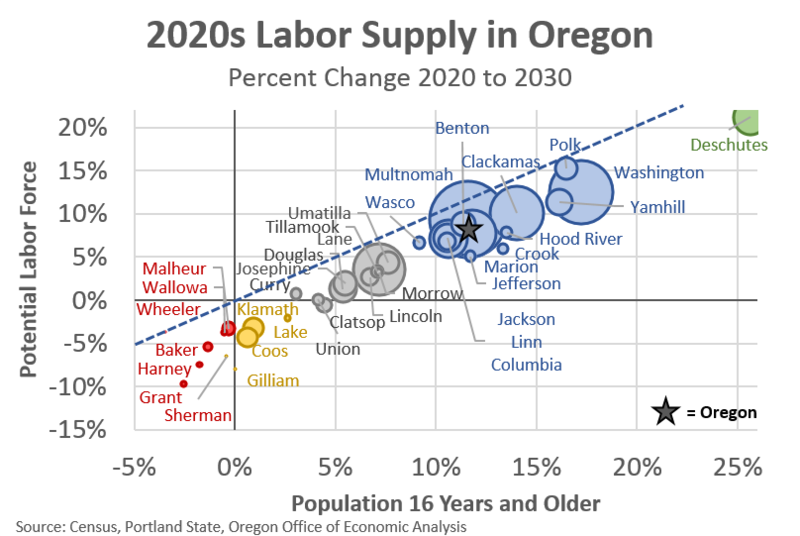 Our office’s measure of the potential labor force — taking demographics and adjusting based on participation rates by age — is expected to increase in the 2020s at half the rate Oregon experienced in the 1990s and one-third the rate as back in the 1970s when the Boomers entered into the workforce. Our economy will continue to grow and outstrip the typical state. However this growth will be significantly slower than we have become accustomed to. This has been the underlying character of our office’s forecasts for years as these trends directly translate into fewer job gains and slower growth in business sales and tax revenues. The demographic decline facing large parts of the country are not benign. Demographic decline and population loss are not just symptoms of place-based economic decline, they are direct causes of it… Population loss reverberates through housing markets and municipal finances. 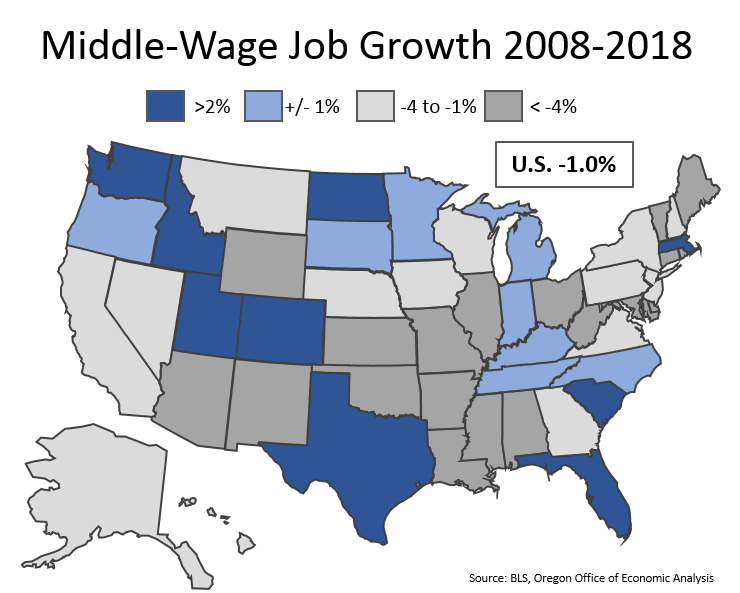 Low-growth places have weaker labor markets and suffer from less economic dynamism. Much of the report focuses on not just the demographic challenges, but how they vary across the nation. As the authors note, roughly half of U.S. counties lost population over the past decade and 80% lost prime working-age population (25-54 years old). Here in Oregon it is not quite as dire as “only” 3 of our 36 counties saw minor population losses during the past 10 years (Grant, Harney, Sherman). Relative to the rest of the country, these counties fall more in the middle of the distribution given the worse trends in the Northeast and Midwest. Oregon demographics as a whole are better off than much of the country. We are seeing stronger population gains and more widespread gains across the state. That said, Oregon is not immune and face the same big picture issues, albeit to a slightly less degree. In terms of the outlook, demographics are going to get worse before they get better. Over the coming decade, according to the latest Portland State forecasts, Oregon’s counties will avoid significant population losses, although there will be some. That’s the good news. However 11 of our 36 counties will experience a shrinking potential labor force. In 2030, there will be fewer residents available for work and likely fewer workers overall in these counties. A few other counties will see no growth in their potential labor force. Overall, the number of residents available for work in every single county will increase at a slower rate than total population growth due to underlying demographics. However, the outlook does not call for a downward spiral forever. Once we get past the bulge of upcoming retirements, the outlook improves. In particular, rural Oregon will see the biggest swings and improvements relative to recent years. This is something our office tried to highlight a few years ago. When it comes to the demographic drag, what matters is aging from one’s 50s to one’s 70s. This is when people go from their peak-working and peak-earning years to nearly everyone being retired. Given demographic trends, including some young adults moving away to urban areas, rural communities are nearly all the way through the demographic drag. You can see this below where the growth rates all pick up considerably for the North Coast, Northeastern, and Southwestern Oregon. 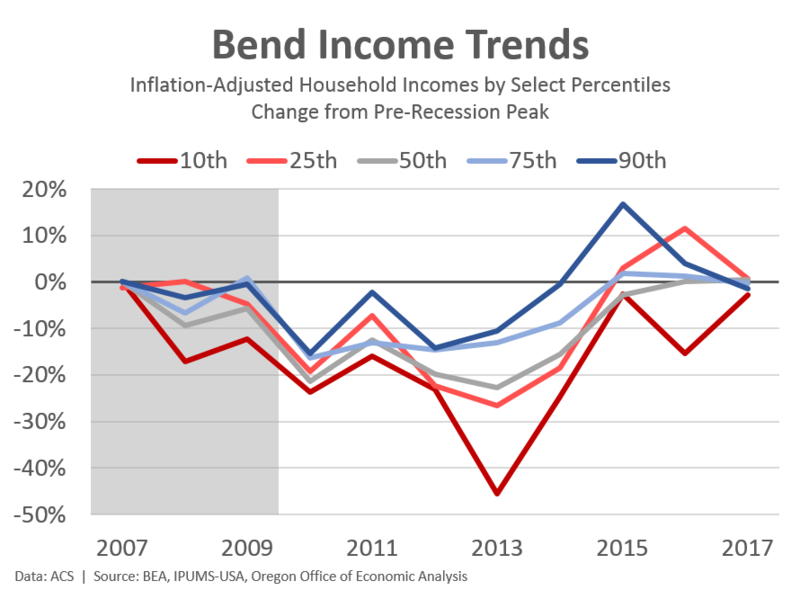 Even Southeastern Oregon, which faces the biggest demographic and population growth challenges, goes from losses to relative stability. Conversely, while urban Oregon will still outpace rural areas, the state’s fastest-growing areas are set to slow down in the coming years. The inflow of new migrants will be slower as migration rates trend down and the demographic drag hits; the Gen Xers and Millennials who moved to Oregon in recent decades will get to retire someday, probably. 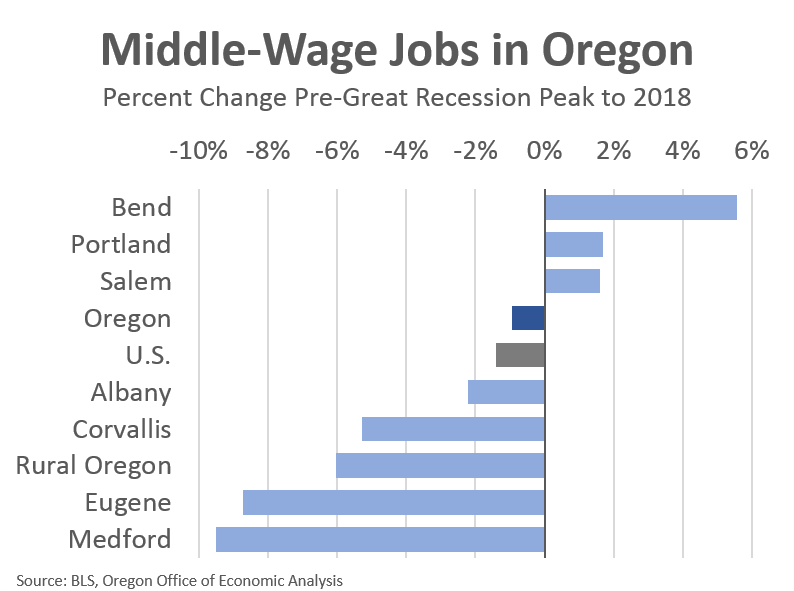 As such, growth will taper in Central Oregon (Bend mostly) and the Portland region. Oregon’s other urban areas like the Rogue and Willamette Valleys will see relatively steady gains. Demographics are a very powerful force. For now they are largely pointing in the wrong direction. The EIG report notes that by 2037 two-thirds of U.S. counties will have fewer prime working-age adults than they did in 1997. Here in Oregon we are not immune but are somewhat better off given migration flows. 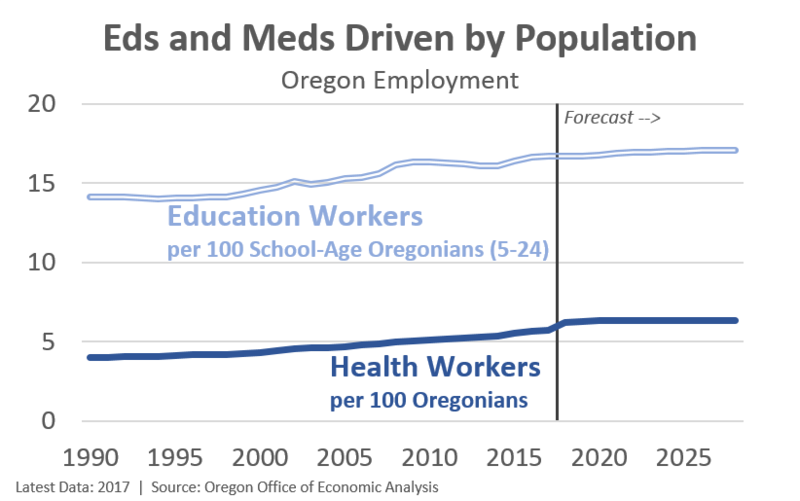 From 2000 to 2040, 14 Oregon counties will have a smaller prime working-age population and 11 of them will have a smaller potential labor force. A slower-growing and in some places an outright smaller economy is and will be a tremendous challenge. It weighs on the workforce, housing markets, business sales, and public services. That said, if the latest population forecasts are reasonably accurate, the trends will be improving in a handful of years as we reach peak retirements. Finally, the report dives into a lot more information (do read it) but one item it discusses in educational attainment. Our office looked at this in our Rural Oregon report as well. 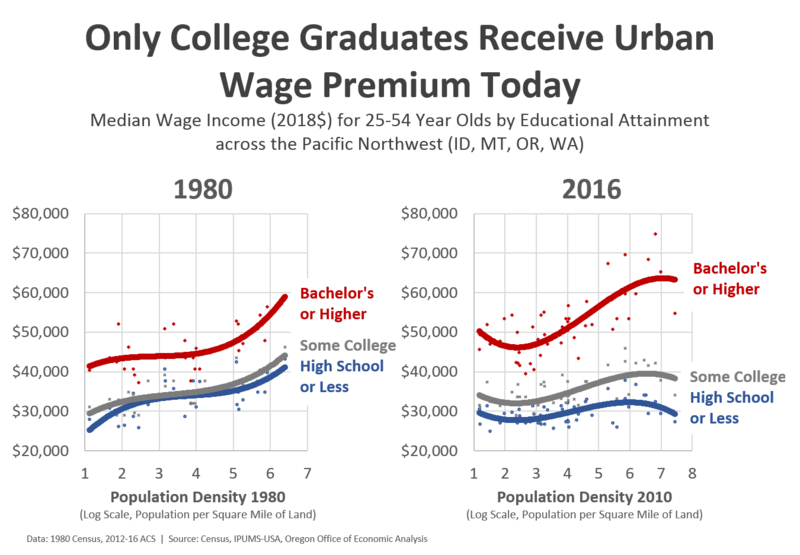 Now, one potentially complicating factor is the lack of an urban wage premium today for those without a college degree. It is possible that this will further alter migration and demographic patterns but it is still too early to tell if and how much. 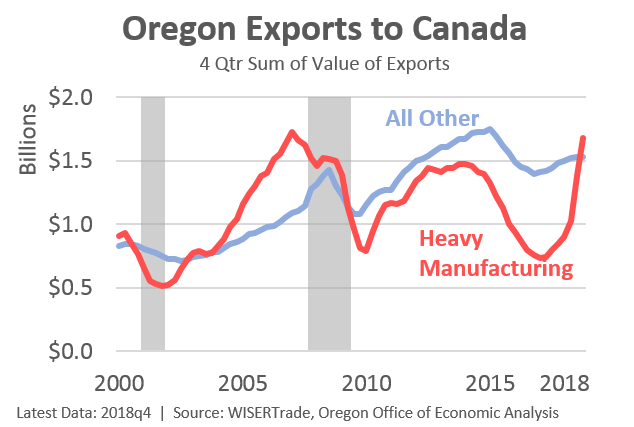 Last month we examined industries and regions in Oregon that grow faster (or slower) and are more volatile (or stable) than the overall economy. 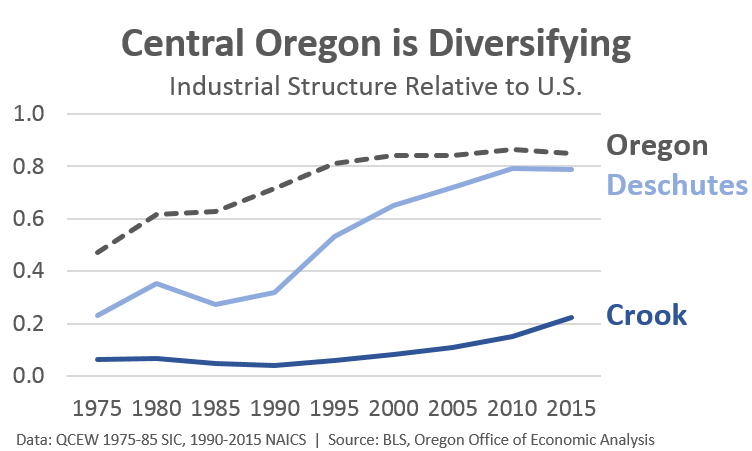 Today we follow up with a look at industrial diversification and how that has changed over time in Oregon. First, when we look at industrial diversification, economists typically look at how many jobs are in each sector of the economy. A more diverse region has a smaller number of jobs in a lot of different sectors (e.g. manufacturing, health care, etc) while a less diverse region has a large number of jobs in just one or two sectors (think oil in North Dakota today, or timber in Oregon in the 1970s). Second, in and of itself, industrial diversity is not necessarily good or bad. If a regional economy has one big industry, like North Dakota today or Oregon in the 1970s, the region can do extremely well when that one industry is booming. The problem arises when your one key sector is down. Then your regional economy suffers more as there are fewer other types of businesses to drive growth. This tends to make less diverse economies more boom-bust. Depending upon the duration of the cycles, this is either a net win or net loss relative to the rest of the country. Third, it is hard to predict what type of shock will hit the economy in the future. Depending upon what exactly is the catalyst for recession — think technology in 2001 and housing in 2007 — a regional economy may do better or worse depending upon how reliant the region is on that particular sector. 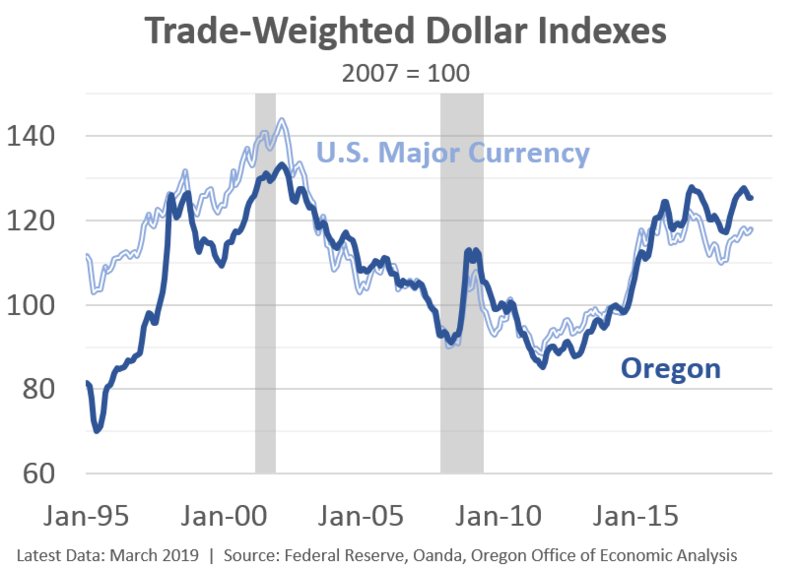 For example here in Oregon during the 2001 recession the Portland region was hit particularly hard due to its high concentration of tech manufacturers. The rest of the state experienced significantly smaller recessionary impacts. 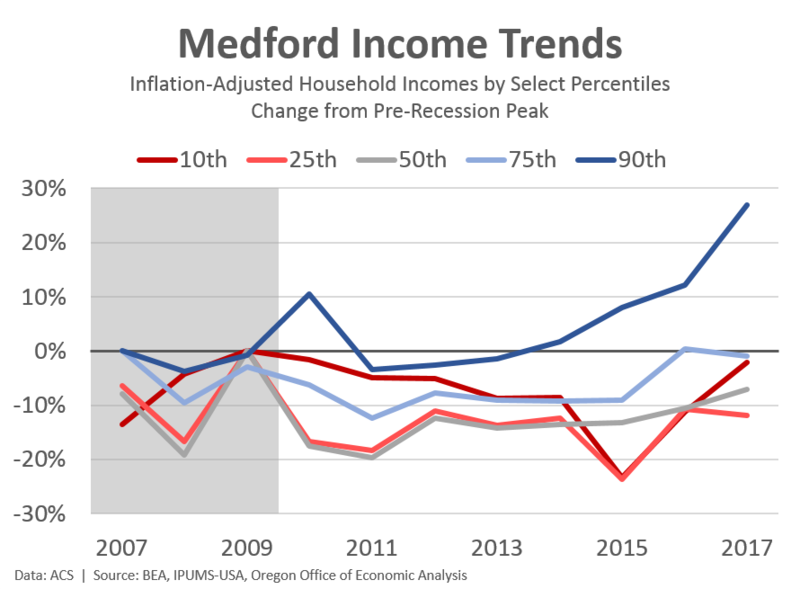 Similarly during the Great Recession Bend and Medford were hit especially hard given they experienced two of the nation’s biggest housing bubbles. Other parts of the state were not spared, but saw relatively fewer losses. Overall a more diverse economy is better able to withstand different types of recessions, especially given we cannot accurately predict the nature of the next shock years in advance. Spreading a region’s eggs across more baskets tends to be more resilience over the long run. The next two charts try to show how Oregon and some of our regions are doing on diversity. What the charts measure is the local mix of industries relative to the mix of industries nationwide. A value of 1.0 means the local mix is perfectly aligned with the U.S. mix. The U.S. overall does have a broad-based economy when compared internationally. A given region will never perfectly match the U.S. given we do have some regional specialization (autos in the Midwest, timber in the PNW, finance in NYC, etc). But values closer to 1.0 mean a more diverse economy overall. Across Central Oregon, industrial diversification is at record highs. Bend’s evolution from a small timber town to a fast-growing metropolitan area is clearly seen in the data. Keep in mind that the U.S. overall (the baseline comparison here) is continuing to evolve, so when a region’s line increases in the chart, that region is diversifying at an even faster pace than the nation. In Prineville (where I am giving a presentation this morning) they do see lower levels of diversification being a smaller, rural economy. They have higher rates of natural resources and federal government (land management), and lower rates of more urban industries like finance and professional and technical services. Crook County’s lower levels of diversification are also seen in manufacturing. Overall Crook’s manufacturing sector is nearly identical in size to the U.S. (proportionately). However 75% of Crook’s manufacturing is wood products, while the U.S. as aerospace, autos, metals, semiconductors and the like. All of that said, Crook County’s industrial diversification has nearly quadrupled in recent decades. Hopefully this bodes well for future business cycles. On the other hand, the Portland regional economy is pretty diverse and broad-based today, more so than many parts of the country. However from this high level of diversity, Portland is not increasingly becoming more like the nation. Now, Portland does retain some specialities like semiconductors, the outdoor apparel cluster, and the like. 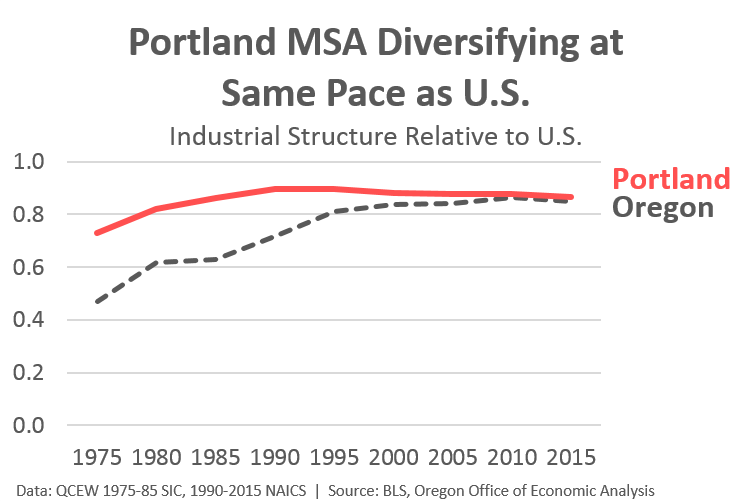 But overall, Portland’s evolving industrial structure is matching trends with the country. Finally, it is important to keep in mind that there are good and bad ways a regional economy can become more diversified. The good way is when a new business opens up and brings with it jobs and investments from a sector the region didn’t have before — think of the software jobs in Portland or the data centers in Prineville. These communities are more diverse today due to these newly created jobs. 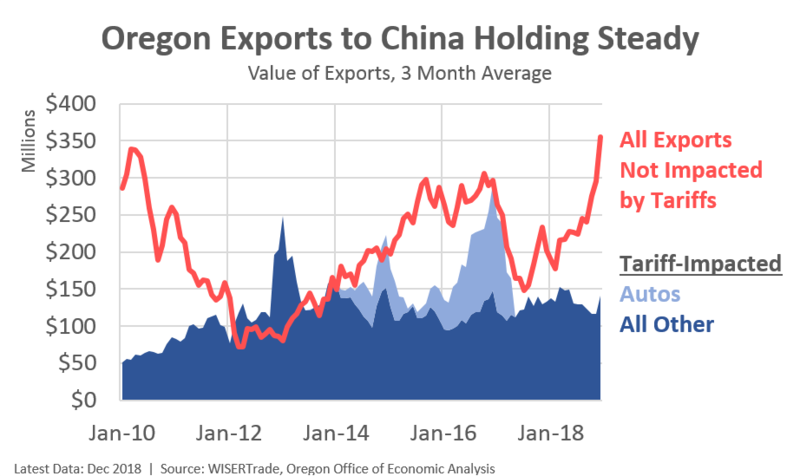 Conversely, a region can become more diversified and more like the U.S. if it loses its specialty industries — think of the timber decline here in Oregon. Today we are more like the U.S. mostly due to growing jobs in other sectors, but also in part due to the loss of timber jobs which mathematically makes us more like the nation as a whole. You can literally see the old mill closure in the Bend chart above. In Crook County back in 1978 a full 50% of private sector jobs were logging or wood products, whereas today it’s closer to 12% of private sector jobs. Overall, a diverse regional economy is better able to withstand different types of recession and be more resilience over the long run. Even so, it is clear that diversification can be a two-edged sword. Stay tuned as we will highlight some new research that touches on the impacts of this bad type of diversification and also ties in with the educational attainment, wages and migration discussed earlier this week. 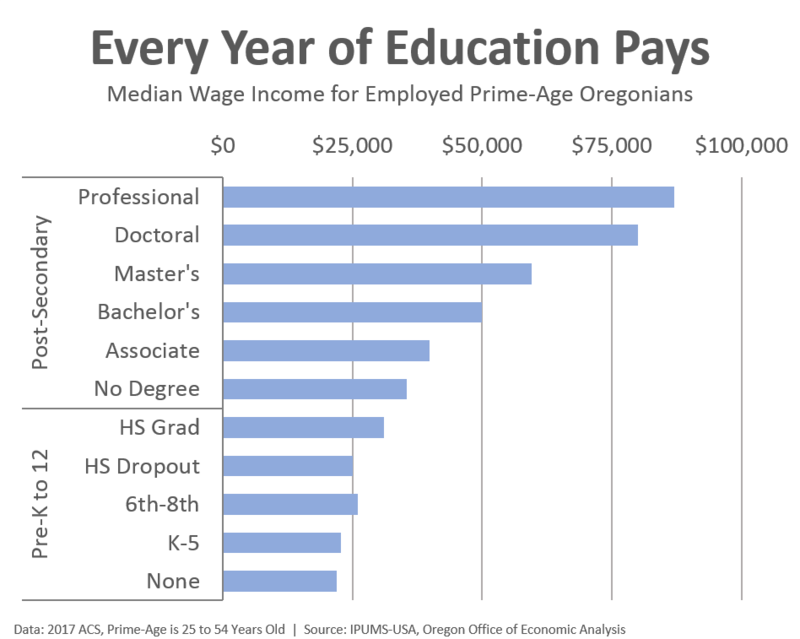 A few years ago we looked at educational attainment across generations here in Oregon. What it showed is that educational attainment is increasing over time. That is, Millennials are obtaining college degrees at higher rates than Gen X which did so at higher rates than Boomers and the like. In the latest Census data these trends continue. Millennials in Oregon today are well on their way to reaching and surpassing the 40% mark with a Bachelor’s degree or higher. In fact the 1985 birth cohort is currently sitting at 39% at age 32, while the 1990 birth cohort is at 36% at age 27, both of which are records for the fastest pace to reach these marks. 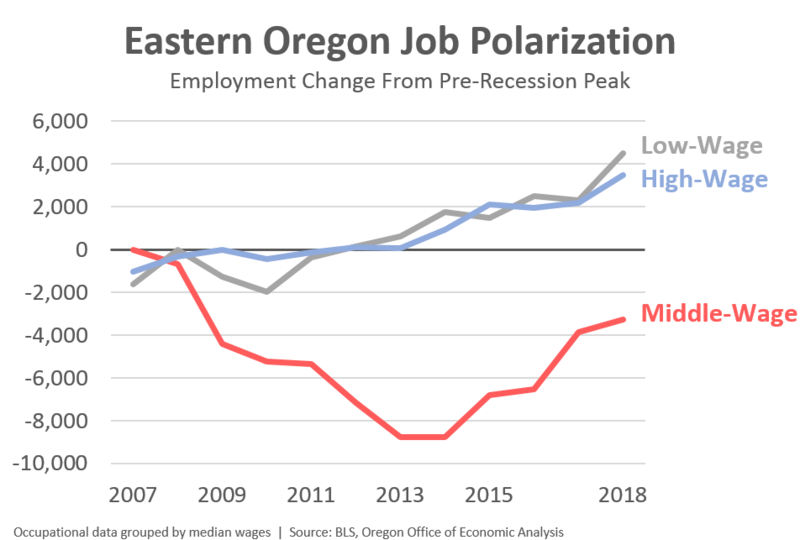 However, we also know two other items: Oregon is magnet state, and migration is strongest among young, college graduates. All of these facts combined have been gnawing in the back of my brain for years now. I have been curious as to the educational attainment of native born Oregonians. It is possible, even plausible that the rise in educational attainment across the state is largely driven by the in-migrants. Does Oregon’s lower high school graduation rate, shorter school year and the like impact outcomes for higher education as well? So to the data we turn. I want to highlight this gap in attainment between migrants and the native born population to illustrate the compositional effect migration has on statewide totals and how migration may mask diverging trends. But first we must point out that Oregon-born Millennials have approximately the same, albeit slightly lower levels of educational attainment than their national counterparts. Today, 34.3% of Oregon-born 25-34 year olds hold a Bachelor’s degree or higher, while the national figure is 35.6%. 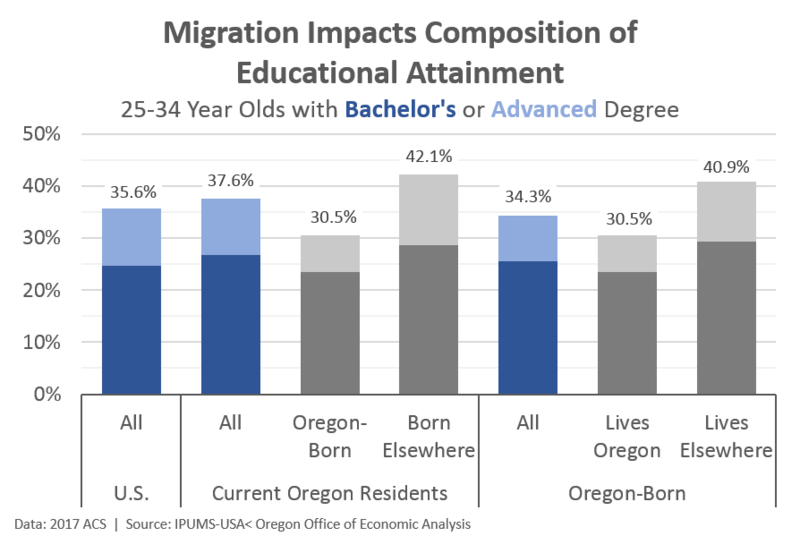 However, migrants moving into or out of Oregon have substantially higher levels of attainment as seen in the chart below. 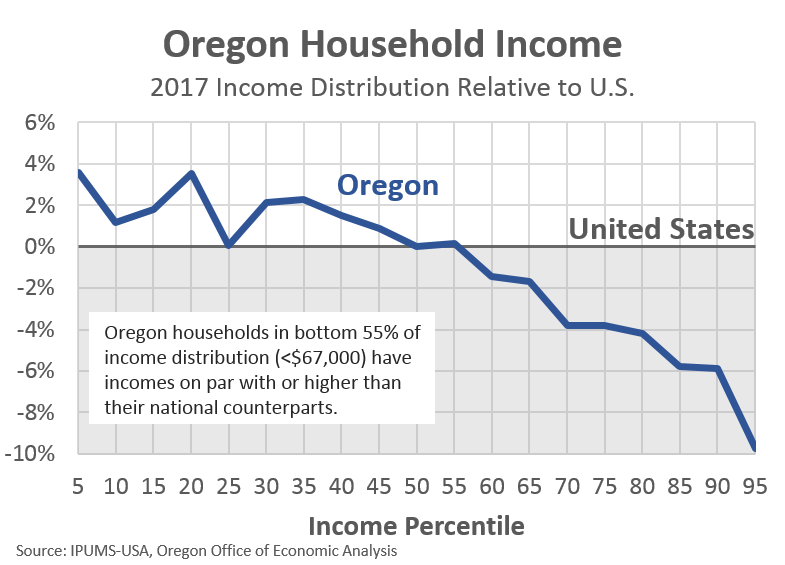 And given that the Oregon-born who leave the state have high levels of attainment, it means that the Oregon-born who remain here have lower levels. This is entirely due to the compositional effect of migration, which, again is all about young, college graduates. The gap is not necessarily about lower outcomes. It is important to remember that Oregon is a magnet state. The inflow of young households is significantly larger than the outflow. Even with similar educational attainment among the movers going in either direction, Oregon’s educational attainment rises overall due to the net influx. There are two pieces of good news here. 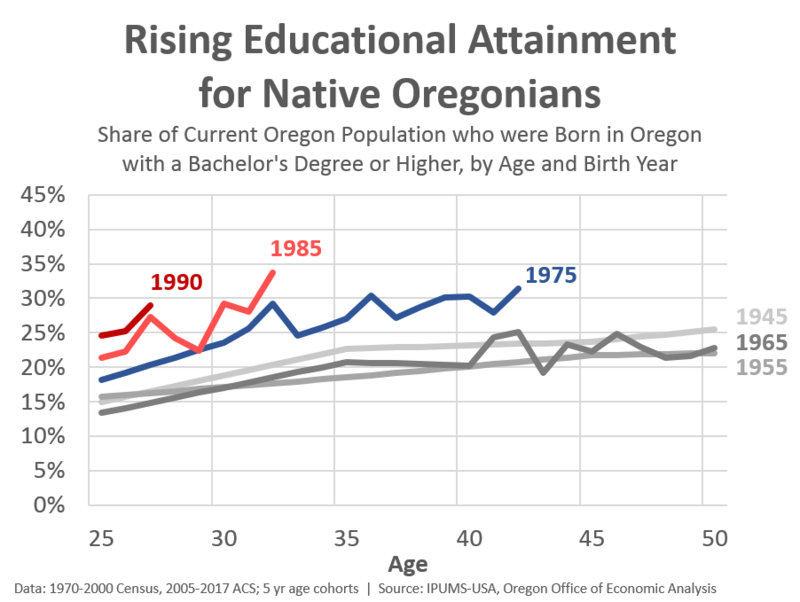 First is that if we look at educational attainment of native born Oregonians, it is rising over time like national trends. 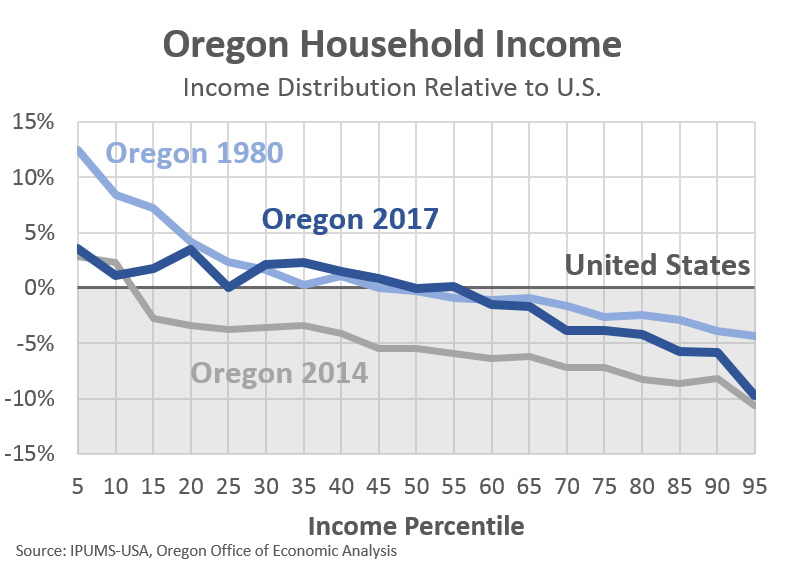 Now, the chart below just looks at current Oregon resident who were also born in Oregon (my data download is missing those who moved out of state, but we know those folks have even higher rates of attainment). The gap between current residents born in Oregon and born outside of Oregon remains large (as seen in the first chart). This gap is 5-10 percentage points, but is not widening over time or by age cohort, or at least not in the available data. 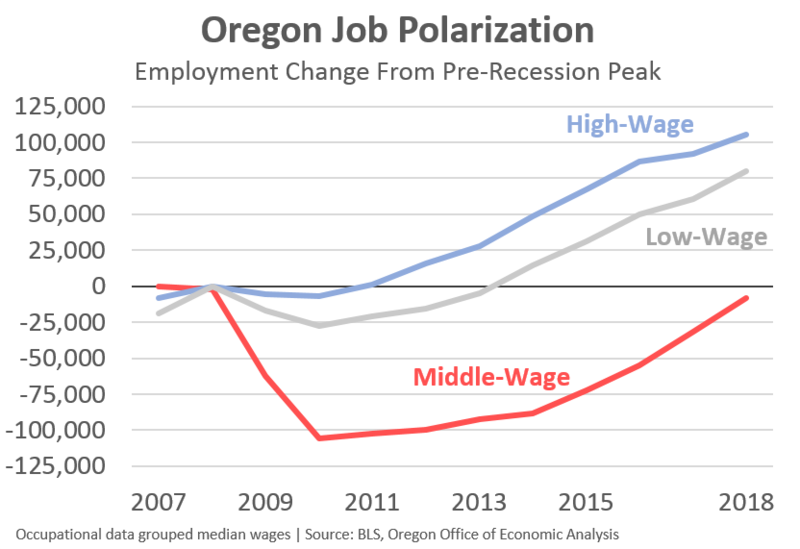 The second piece of good news is that there does not appear to be a wage differential between the Oregon-born and migrants. Or at least not once we control for age, educational attainment, and occupation. This is important to keep in mind because one of the underlying goals of economic development is not just to improve job opportunities and outcomes overall, but to specifically improve them for a region’s current residents. As we touched on with Raj Chetty’s work on economic mobility, job growth by itself is not enough to improve outcomes. One reason is that economic conditions for current residents may remain relatively unchanged while new residents fill the newly created jobs. We know that the latter part does happen, but it is important to check in and see about the former. And at least in a preliminary look at wages among the prime working-age population in Oregon, this does not appear to be a significant issue. Stay tuned, there is actually a tie-in of this look at educational attainment, migration and wages to some future work we’re doing. The U.S. economy experienced strong economic growth in 2018. Unemployment remains near historic lows even as participation rates rise. Wage growth continues to pick up along with employment rates. The economy will set a new record for length of expansion this summer at ten years old. The next recession is not yet seen in the data. The outlook calls for ongoing, but slowing growth this year and next. The fading federal fiscal stimulus and business investment slowdown take the wind out of the sails, as does the impact of past interest rate increases. The key to the near-term forecast is the Federal Reserve and the U.S. consumer. Right now the Fed is reassessing the economy given somewhat weaker U.S. data and ongoing international issues like trade tensions and slowing in China and Europe. 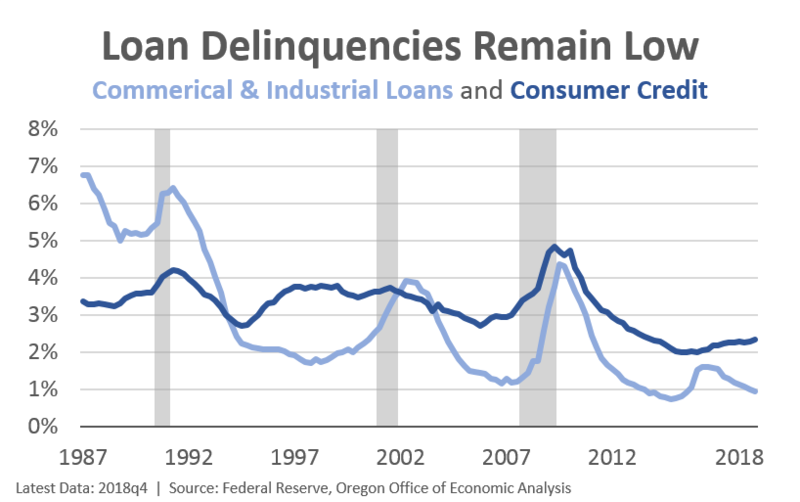 Concerns over the U.S. consumer are higher today due to weak sales data at the end of 2018 and somewhat higher delinquency rates. However, given the ongoing, robust labor market gains, consumer spending is likely to hold up and is the key driver to growth in 2019. 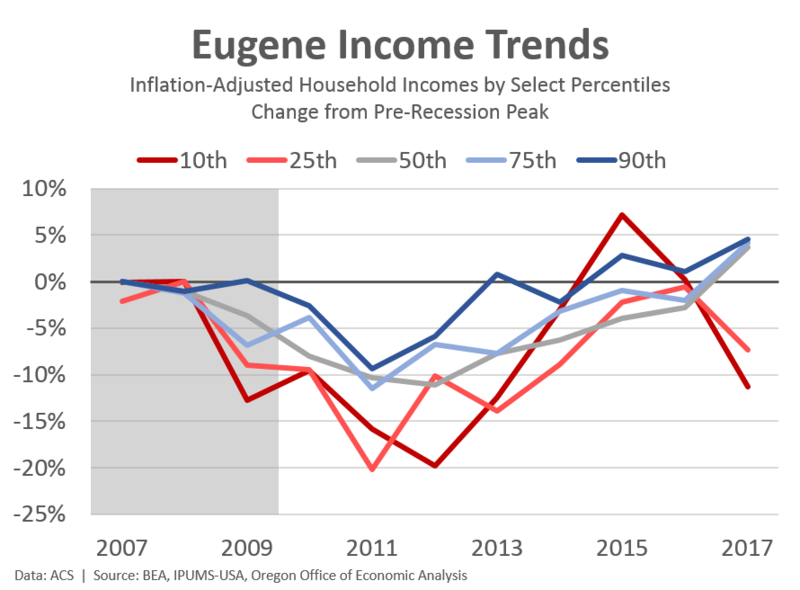 Oregon’s economy continues to hit the sweet spot. Job growth has tapered more than expected over the past year, but remains strong enough to hold the unemployment rate near historic lows. Local wage growth outpaces national figures due to the strong labor market. 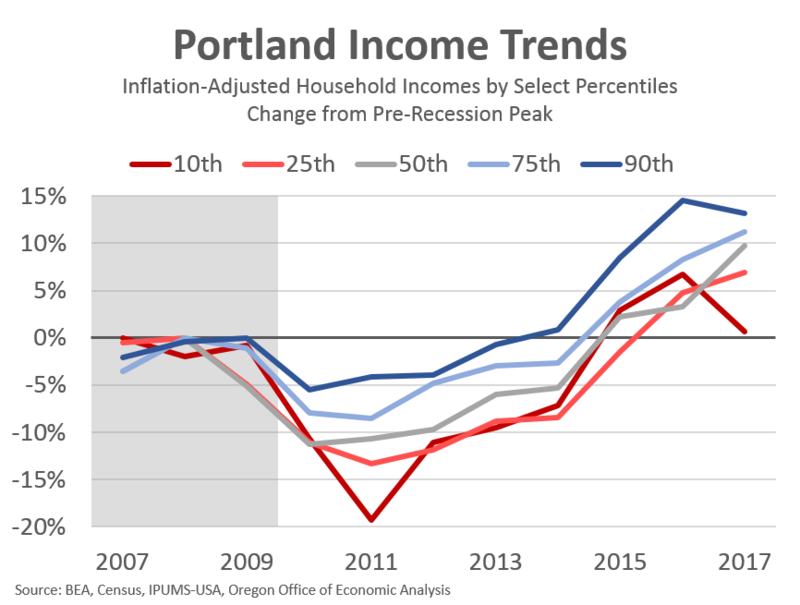 With more Oregonians working more hours and for higher pay, household incomes are reaching historic highs on an inflation-adjusted basis. Even as disparities remain, these gains are seen by all ages and racial or ethnic groups across the state. The feel good part of the economy is here. With a little more than four months left in the 2017-19 biennium, Oregon’s General Fund revenue picture remains uncertain. Given Oregon’s dependence upon personal income tax revenues, the jury will remain out until the bulk of payments are received and processed in April and May. The tax filing season has just begun. Refunds got off to a slow start and the average refund is 11% lower so far this year, in part due to no kicker being paid out. Most year-end tax payments won’t arrive for at least another month. Although April surprises are commonplace, this year’s outlook is particularly uncertain. Federal tax law changes, volatile equity markets, a nationwide dearth in recent estimated payments and strong growth in withholdings are all acting to muddy the outlook this tax season. Corporate collections have surged to an all-time high in recent months, due in part to temporary factors. Repatriation of foreign earnings required by the new federal tax law have increased collections by around $100 million. However, the temporary repatriated earnings alone cannot explain the full increase in corporate collections, suggesting that some of the change may be persist going forward. 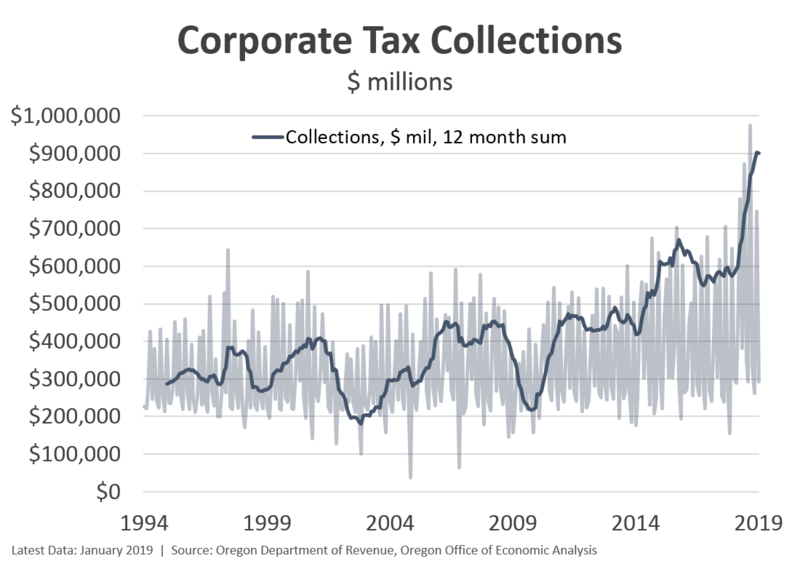 Federal tax law changes have likely expanded the corporate tax base in Oregon, which will lead to additional revenues in the years ahead. While the revenue forecast is relatively unchanged in the currently 2017-19 biennium, our office is forecasting both a personal and corporate kicker. The personal kicker is projected to be $748 million which will be paid out on tax returns in early 2020. The corporate kicker, which is dedicated to education spending in the upcoming biennium, is currently estimated at $353 million. Given tax season has just begun, these figures could change by May 15th, the final forecast for the legislative session.